Blocking Mejlis is a blatant attack on the rights of the Crimean Tatar people, it said. The EU Delegation in Ukraine in its statement on Facebook has condemned the suspension of the Crimean Tatar self-styled government Majlis [Mejlis] in Russia-controlled Crimea. "Yesterday's decision by the so-called prosecutor of Crimea to suspend the activities of Mejlis, a self-governing body of the Crimean Tatars, is extremely worrying and constitutes a grave attack on the rights of the Crimean Tatars. This decision, taken in the context of the on-going court case aiming at banning its activities as an extremist organisation, must be reversed immediately. The EU has consistently reiterated its concern about the deterioration of the human rights situation on the Crimean peninsula since its illegal annexation by the Russian Federation in 2014, including as regards the persecution of persons belonging to minorities. The EU reiterates its call for full compliance with international human rights standards and other obligations under international law," reads the statement. 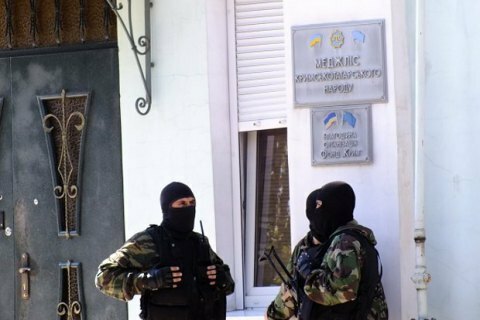 In early March, the "Supreme Court of the Crimea" has begun consideration of the claim for recognition of the Mejlis as an extremist organization and he banning of the organisation. On 13 April, the Moscow-backed chief prosecutor of Crimea Natalya Poklonska issued an order to suspend the activities of the Mejlis. In this connection, the chair of the organization Refat Chubarov called for an urgent meeting of the UN Security Council.